Overall: Avalanche hazard has decreased now that we are over 48 hours out from the last storm. However, the potential for new wind loading and overloaded persistent weak layers will keep the hazard elevated. 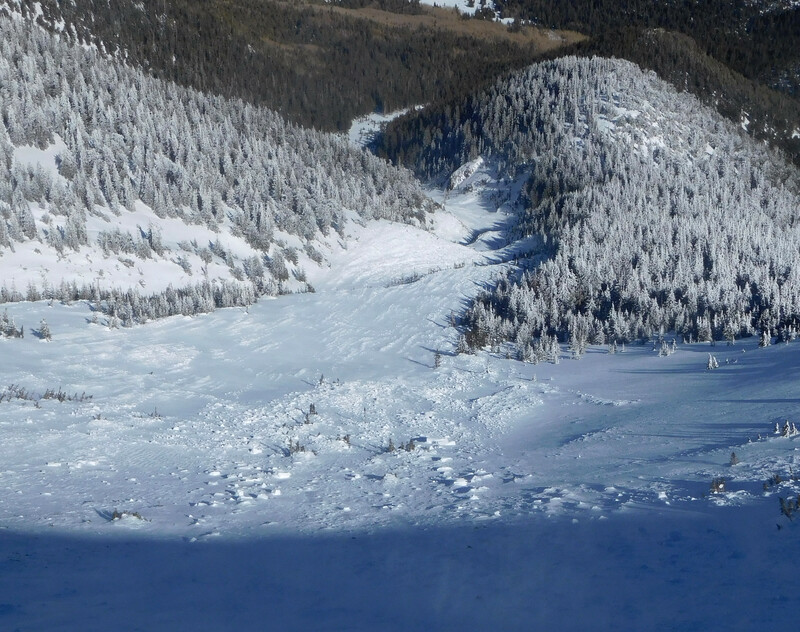 Natural avalanches are possible and human triggered avalanches are likely, primarily above 11,000 on northeast and easterly aspects. Northwest, north and possibly southeast aspects should be considered suspect. Travel in avalanche terrain near and above treeline will be least reactive on west, southwest, south and southeast slopes, as long as the slopes are not connected to northwest and easterly slopes. Hopefully the right combination of wind/clouds/temperatures will keep the snow in good shape on these sunny slopes. But remember, improving stability does not mean that no avalanche hazards exist. Snowslide Canyon Bowl avalanched (photo below). This likely occurred between February 5th, Tuesday night and February 6th, Wednesday morning. This is primarily an east aspect with some southeast and northeast. The crown was over 600m wide, and it ran over 1100m (0.7 miles). There is more crown not shown in the photo that wraps around Snowslide Canyon. The average crown height was 1m with a maximum of 1.75m. The avalanche failed on facets near the ground. The bed surface was old snow and crusts. Characteristic classification is HS N R4D4 O.The slope angle was between 35° and 42°. There is a report that Dunham Canyon may have also slid but this has not been confirmed. Near and Above Treeline:Watch for older (February 6th) windslabs on easterly aspects and new slab development on northerly, northeasterly and easterly aspects. Winds are forecasted to blow south, southwest and west over the weekend. Watch for reactive persistent weak layers. These may be buried under 2 to 5 feet of slab on east, northeast, north, and northwest aspects. Southeast aspects may be suspect as well, especially on slopes connected to easterly aspects. Prior to this week's precipitation, wind scoured zones reduced the snowpack down to bedrocks in some areas. Also, sun and wind conspired to create hard snow prior to recent precipitation. Crampons may be helpful where new snow has been wind-scoured down to hard icy snow. Below Treeline:Persistent slab instabilities exist in our snowpack. A reactive, faceted weak layer exists about 30 to 50cm from the ground, primarily on east, northeast, north and northwest slopes. It is not everywhere but recent avalanche activity indicated that it's still an issue. Carefully assess run out zones and terrain traps. You will find great snow and low avalanche hazard if you stay off and do not get under slopes that are greater than 30°. Watch for older (February 6th) and newer windslabs on north , northeast and easterly aspects. Winds are forecasted to blow south, southwest and west over the weekend, with a chance for snow on Sunday/Monday. Post weekend winds may create slabs on other aspects. As always watch for cross loading in gullies. Slopes just below ridges and on the flanks of shoulders should be considered suspect. Keep an eye on the ASBTP weather station. Readings between 15 and 35 mph indicate the potential for snow transport and formation of wind slabs. Look for various links under the weather menu above. Note that this station may get rimed during storms and report erroneously. Weak faceted snow-layers under old and new wind/storm slabs exist at elevations above 10,000'. Column test in Beard Canyon on January 11th and near Alison Clay Bowl on February 4th indicating persistent slab problems. The Snowslide Canyon avalanche was triggered by wind loaded snow falilng on a persistent slab. This problem has been found below, near and above treeline on northwest, north, northeast and east aspects. Our most reactive stability-test failures have occurred near and below treeline. The Snowslide Canyon avalanche crownline was above treeline. This problem is not widespread and predicting its location has been problematic. February 7th photo showing the Snowslide Canyon avalanche. Likely triggered on February 5th or 6th by storm/wind slab developing above a persistent slab problem. Snowslide Canyon avalanche track. Photo from Feb. 8th. FREE Introduction to Avalanches seminar this Tuesday, February 12, at the SMR (Snow Mountain River) store in Flagstaff on South Milton. See our courses page to register for a class and get avy savvy. Backcountry permits are required for travel in the Kachina Peaks Wilderness and available at local USFS locations, as well as, at the Agassiz Lodge on Saturday and Sunday 8:30 -11:30. For information on uphill travel within the Arizona Snowbowl ski area, please refer to www.flagstaffuphill.com and https://www.snowbowl.ski/the-mountain/uphill-access/ for details. Access to the Kachina Peaks Wilderness is available from the lower lots at Snowbowl via the Humphreys Trail and Kachina Trail. The past week has been the wettest so far this winter. Arizona snowbowl (10,800') reported 42" of new snow since Feb. 2nd. Twenty inches fell between Feb. 5th and 6th. The Snowslide SNOTEL (9,730') reported 22" since Feb. 2nd and 9" since the 5th. SNOTEL reported 4.8" of new snow water equivalent (SWE) between Feb. 2nd and 6th. In the aftermath of this storm cycle, cold windy conditions have prevailed. Determining accurate ridge-top wind velocities and direction has been impossible since the ASBTP station's anemometer was incapacitated with rime ice. Lower elevation stations, such as the Flagstaff Pulliam Airport (elev. 6994') reported wind speeds between 15-30 mph, gusting to 30-40 mph, throughout the day on Wednesday February 6th. Cool blustery days will continue into the weekend with wind chill temperatures as low as -17 F on Friday and a chance of snow showers on Saturday from a passing shortwave trough. Ridge-top wind speeds will continue in the teens and higher, gusting to 30-40 mph out of the southwest throughout the weekend. More unsettled weather and a chance of light precipitation is predicted to develop early in the workweek. A more promising chance for significant new snow will come later in the week. Models disagree on impact and timing, but this appear to be a wet storm with a snowline at or above 8000 feet, probably arriving on Thursday, Feb. 14th. On Friday morning, Feb. 8th, the Inner Basin SNOTEL site (Snowslide) reported a snow depth of 50" (127 cm) at 9,730'. Arizona Snowbowl reported a settled base of 70" (178 cm) at 10,800'. So far this winter, 170" (432 cm) of snow have fallen at the mid-mountain study site. Since February 1st, SNOTEL temperatures have ranged between 5°F on February 7th, and 35° F on Feb. 2nd. For the same period, ASBTP (11,555') reported temperatures between -6°F on Feb, 7th, and 31°F on Feb. 1st and 2nd. Sign Up to get notified when we update the summary. The avalanche problem/character describes part of the current avalanche danger. However because we only realease a summary once a week, the current avalanche problem will likely change. Understanding avalanche problems is essential, because it allows you to determine your approach and strategies to risk treatment. Below are brief descriptions of avalanche problems/characters, and links to detailed information on the problem, formation, patterns, recognition, and avoidance strategies. Also see the North American Danger Scale. Release of dry unconsolidated snow. These avalanches typically occur within layers of soft snow near the surface of the snowpack. Loose-dry avalanches start at a point and entrain snow as they move downhill, forming a fan-shaped avalanche. Other names for loose-dry avalanches include point-release avalanches or sluffs. Loose-dry avalanches can trigger slab avalanches that break into deeper snow layers. Release of a cohesive layer of soft to hard snow (a slab) in the middle to upper snowpack, when the bond to an underlying persistent weak layer breaks. Persistent layers include: surface hoar, depth hoar, near-surface facets, or faceted snow. Persistent weak layers can continue to produce avalanches for days, weeks or even months, making them especially dangerous and tricky. As additional snow and wind events build a thicker slab on top of the persistent weak layer, this avalanche problem may develop into a Deep Persistent Slab. Release of a thick cohesive layer of hard snow (a slab), when the bond breaks between the slab and an underlying persistent weak layer, deep in the snowpack or near the ground. The most common persistent weak layers involved in deep, persistent slabs are depth hoar or facets surrounding a deeply buried crust. Deep Persistent Slabs are typically hard to trigger, are very destructive and dangerous due to the large mass of snow involved, and can persist for months once developed. They are often triggered from areas where the snow is shallow and weak, and are particularly difficult to forecast for and manage. They commonly develop when Persistent Slabs become more deeply buried over time. Release of a cohesive layer of snow (a slab) that is generally moist or wet when the flow of liquid water weakens the bond between the slab and the surface below (snow or ground). They often occur during prolonged warming events and/or rain-on-snow events. Wet Slabs can be very destructive. Cornice Fall is the release of an overhanging mass of snow that forms as the wind moves snow over a sharp terrain feature, such as a ridge, and deposits snow on the downwind (leeward) side. Cornices range in size from small wind lips of soft snow to large overhangs of hard snow that are 30 feet (10 meters) or taller. They can break off the terrain suddenly and pull back onto the ridge top and catch people by surprise even on the flat ground above the slope. Even small cornices can have enough mass to be destructive and deadly. Cornice Fall can entrain loose surface snow or trigger slab avalanches. Release of the entire snow cover as a result of gliding over the ground. Glide avalanches can be composed of wet, moist, or almost entirely dry snow. They typically occur in very specific paths, where the slope is steep enough and the ground surface is relatively smooth. The are often proceeded by full depth cracks (glide cracks), though the time between the appearance of a crack and an avalanche can vary between seconds and months. Glide avalanches are unlikely to be triggered by a person, are nearly impossible to forecast, and thus pose a hazard that is extremely difficult to manage. The summaries on this site were written by Kachina Peaks Avalanche Center Board Members. They are based on a broad spectrum of data collected from weather stations, National Weather Service point forecasts and field observation by qualified individuals. These summaries are factual information based on past and current conditions and are not forecasts of what will be encountered in the future or a declaration of the current avalanche danger. The summaries are not intended to substitute for good knowledge and decision making skills in avalanche terrain. If you have any doubt of stable conditions, please stay away from avalanche terrain. You can usually find good places to go that are not prone to avalanches, such as on low angle slopes away from avalanche run-out zones. If you have any questions about where to find such places, you should consider further avalanche educational opportunities, such as those listed on our education page. 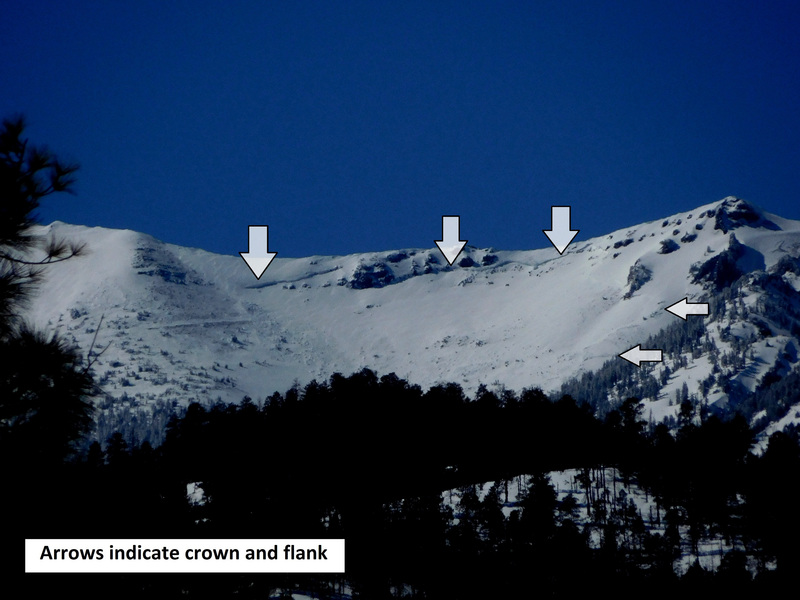 Starting in 2012 Kachina Peaks Avalanche Center (KPAC) has publish a weekly Snowpack Summary on our website. These summaries are currently issued on Friday afternoons. On occasion, we will give storm updates or warnings of rapidly increasing avalanche hazard at more frequent intervals. Our objective is to reach weekend recreationist, informing this user group of prevailing conditions, but particularly warning of avalanche hazards whenever they are present. Many people have asked us why we use the format we do, but do not include a danger rating or a hazard/stability rose as many other avalanche centers do around the west. The National Avalanche Center (NAC) advises small operations like KPAC, who do not issue daily bulletins to not use danger ratings in our snowpack summaries due to the regular but intermittent nature of their field observations and the length of time between issuance of snowpack summaries. A primary concern is for how conditions can change in the time between publications, potentially giving the public misleading information. At this point, we simply do not have resources to monitor the snowpack at the level necessary to accurately produce more frequent bulletins. While we understand the benefits of a danger rating using the North American Danger Scale, we also feel that our format encourages people to dig in a little deeper, and spend some time reading what our forecasters are saying. Although the area that we forecast is relatively small, the variability has proven quite large. Inner Basin conditions are often surprisingly different from those on the more wind-affected western side on the Peaks. We hope the information that we provide in summaries helps give you a good overview of what is going on out there, and what avalanche problems you should be attentive to, but if there is every uncertainty, then we encourage you to ask questions via Facebook or our Observation/Discussion Boards.